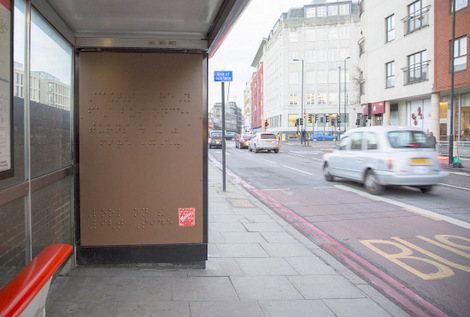 In support of #WorldBrailleDay Mars Chocolate UK has launched a special build bus shelter with JCDecaux. Created by AMV BBDO, the new bus shelter advert takes the form of a poster made entirely of Braille with the dots formed of model-made MALTESERS. The advert will be accessible for all through a combination of audio description and a translation hosted on the Maltesers UK Facebook page. Inspired by a real-life story from a focus group led by MALTESERS® and Scope – the UK’s disability charity, the new billboard celebrates the lighter moments in the lives of those who live with a visual impairment. The advert will run on the bus shelter January 4-15, 2017. This entry was posted on Thursday, January 5th, 2017 at 14:32 @647 and is filed under DailyDOOH Update. You can follow any responses to this entry through the RSS 2.0 feed. You can leave a response, or trackback from your own site.